Today we are going to stay at anchor in Rose Inlet. It’s an hour ride over to SGang Gwaii and since there is limited space in the small cove at this UNESCO World Heritage site, we are all going to travel over in two boats rather than six. Jordan picked us up in the dinghy at 7:30 and dropped us aboard Dream Catcher along with the crew of four from Patos. With Deception in the lead and carrying the rest of the party, we made our way to this unique World Heritage Site. We dropped anchor in 45 feet, with good holding on the northwest corner of the island, designated as the access point. Jordan stayed aboard Deception to watch the boats as this area is listed as having marginal holding. Given the ideal conditions today, I would have no problem leaving my boat unattended for a couple of hours. Though the day started off cloudy with a little rain, the sun peeked through the clouds on our trip over from Rose Inlet and began to seriously shine as we landed on the beach. 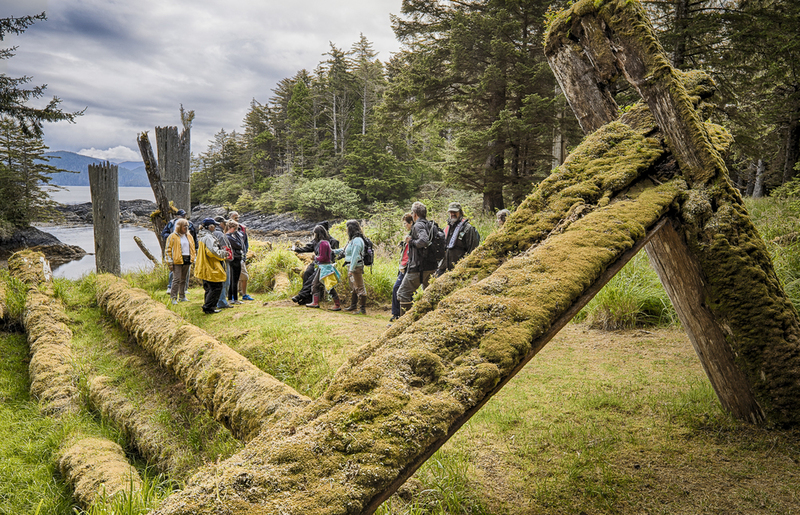 The United Nations Education and Science Organization (UNESCO) declared this island a World Heritage site because it is the best representation of a Northwest Coast First Nations village. It is the last village in the Gwaii Hannas to be occupied full-time. In its final years of occupation, there were 20 longhouses, along with many memorial, frontal and mortuary poles. That was in the late 1800’s. Little remains now. The mortuary poles were “re-raised” in the 1960’s when the larger frontal poles were removed by Canada and placed in museums for preservation. 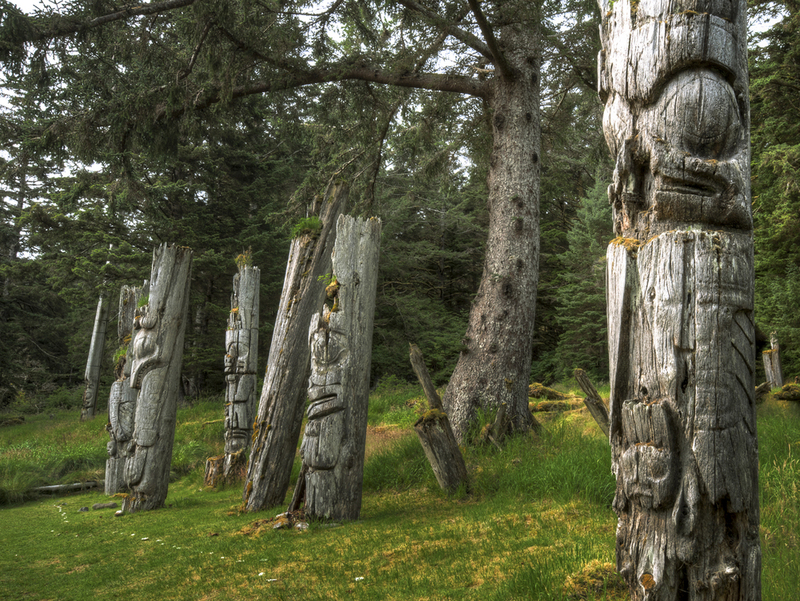 The Haida people intend for all these poles to decay and return to the earth, that is part of their belief system. The mortuary poles, raised in honor of Haida of high standing, contained the remains and the “spirit” of the individual. As the poles fall and are reclaimed by the earth, the Haida believe the spirit is set free. Thus, all remaining mortuary poles will be allowed to fall over time. Therefore it was a great privilege to see this site; so few have the opportunity to visit such a remote location. With only 1,000 to 1,500 visitors a year, it will only be a few more generations who will be able to gaze upon this village before it returns completely to the earth. Our Watchman guide for today is Doug. His mom was a Watchman before him, and he spent his summers growing up on this island. He brought a very unique perspective as he explained the Haida culture and the various details of this village. It was not hard to imagine visitors to this Haida clan as they came into the small protected bay in front of the village. Doug described in detail the customs that the visiting chiefs would perform to show respect for their host. Karen was particularly taken by the mortuary poles, and the beautiful carvings on them that told key stories of importance to the person they were raised to honor. While the poles have decayed, you can still see the Black Bear, or Grizzly Bear, or Eagle figures, and Doug shared the story of many of the poles. If the “head” and “body” of the figures were of equal size, it implied the pole was post-contact with Europeans. If the “head” was bigger than the “body”, that pole was typically pre-contact. We also learned that Black Bears on these poles have their tongues out and claws that look like fingers, while "Grizzlies" have teeth and more claw-like appendages. After a spectacular time on shore, it was back into the dinghy, and then a sunny return to our anchorage in Rose Inlet aboard Dream Catcher. Karen and I spent the afternoon determining our destination for tomorrow. This is where we part ways with the rest of Mother Goose. They are heading to Hurricane Anchorage just off the BC mainland, but we want to head as far south as practical. Because the watermaker is not working, we added a stop on Saturday at Duncanby Landing, and tomorrow we will anchor in Pruth Bay, leaving us just 27 miles to travel on Saturday where we understand there is water, power and even a restaurant! Tomorrow our trip is 120 miles, the longest single leg we have ever done, crossing the notorious southern half of Hecate Strait. The rest of the afternoon was spent processing photos I can give to Emmelina aboard Deception that she’ll use in the DVD she prepares for every Mother Goose leg as a souvenir. The evening was spent aboard Dream Catcher with Lance and Kathy, sharing thoughts on this trip and planning another in the fall. We also said goodbye to the other crews and got into bed at 9:30 for a 4:00am wake up tomorrow. Our last weather check said that we would have a fairly calm crossing – let’s hope it holds true!